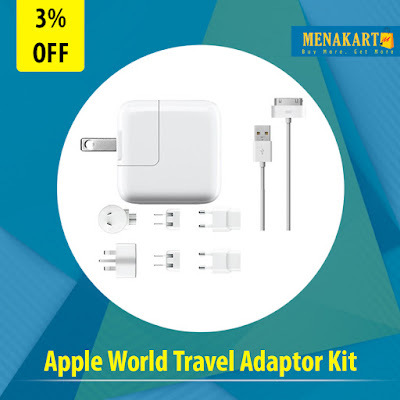 Apple World Travel Adapter Kit The World Travel Adapter Kit includes the Apple USB Power Adapter, USB Cable and six interchangeable AC adapter plugs for use with iPod and iPhone. The adapter plugs can also be used with Apple MagSafe Power Adapters, Portable Power Adapters, and AirPort Express, so you can plug your power adapter into most electrical outlets around the world. The Kit is designed to work with iPod, iPhone, Apple MagSafe Power Adapters, Portable Power Adapters, and AirPort Express.